Unfortunately, the new Millswood Station is already raising concerns from nearby residents. Not because of the station itself but mostly due to alack of planning by DPTI. The complaints result from light spill into nearby homes and lack of privacy. Both of these problems are easily fixed, firstly by shielding the lights (as they have done at Clarence Park) and by erecting screens (as they have in Arundel Ave). It seems both are promised. Surprisingly, even a screen is promised even though the same, and equally as valid concerns, from residents in the southern end of Arundel Ave have been ignored. A MILLSWOOD woman says her family’s privacy has been seriously compromised following an upgrade of Millswood station. The Transport Department cleared shrubs which formed a barrier between Georgia Loudon’s Varden St house and the Millswood station platform. 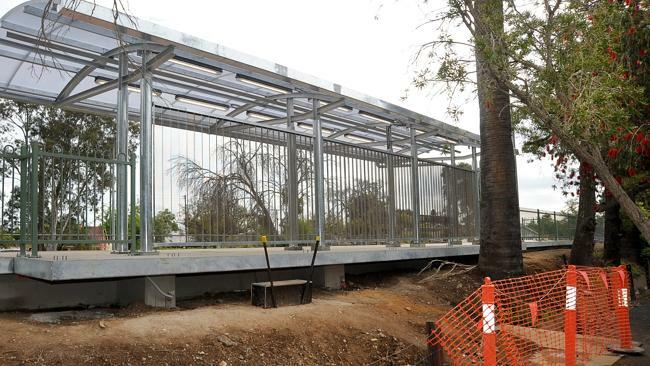 The shrubs were removed during a $500,000 upgrade of the station ahead of a 12-month trial reopening from next month. Commuters on the platform can now see into Ms Loudon’s front yard and lounge room windows. She called on the department to replant mature plants to ensure her family’s privacy. “It’s disgusting,” Ms Loudon says. She did not want to install curtains or blinds or a new fence. “We wouldn’t replace the fence because we’ve just spent thousands on a new one in the past 18 months,” she said. Transport Department spokeswoman Melissa Martin said a screen would be installed but refused to say whether it would happen before the trail started. She would not say what materials would be used. Other Millswood residents have raised concerns with the station’s upgraded lighting and potential parking issues. Avenue St resident Barbara Giles wanted new lights dimmed to reduce the impact on neighbours. The department said the upgraded lighting was necessary to meet disability requirements, but might be adjusted when the station opened. Another Avenue St resident, Wally Szachnowicz, was concerned drivers would use his street as an all-day carpark. Unley Council chief executive Peter Tsokas said staff would monitor parking during the trial. “This review will provide guidance on the need, type and extent of parking management measures that may be required,” Mr Tsokas said.